Everything in life happens for a reason they say.... sometimes it's funny how things in life work out and how some things in life don't work out. The universe definitely works in mysterious ways. 5 years ago I auditioned for Masterchef and although I didn't make it on the show at that time, it is not because I didn't deserve to be on there, but because everything happens for a reason. Never in a million years did I think I would be inspiring my fellow teammates with Arbonne with my cooking and inspiring others. I am so blessed that Arbonne found me and the amazing people that came along with it. Arbonne came to me at a time that was just right. It was at a time where I was struggling with myself emotionally and I needed to once again find that happy me that had been lost for so long. Within a month of starting with this amazing company, my husband could see how much I was turning back into the woman that he fell in love with. The woman who lost herself emotionally was coming back to him and it was all because of Arbonne and the amazing team that came with it. As I came out of my shell, I kind of half did the 30 day challenge by doing Shakes, Fizzies and doing Keto thinking that my digestion issues wouldn't act up, but after about 60 days of Keto, my body said "STOP EATING DAIRY!!!!" and I started getting super sick when I had dairy, so I immediately had to cut it out, so Jack and I decided to take the plunge and go full force with the Arbonne 30 days to Healthy Living and it's been a blessing for my digestion and so fun in the kitchen for me. I never though Arbonne would lead me to inspiring these team members with my cooking. That "Me" That was lost has finally once again been found and I'm ready to conquer and inspire and teach. I am so grateful for everything that has come along with all of this and it has helped step out of my comfort zone a little more and EEEEKKKKK even do some Live videos which scares the crap out of me, but you know, if I want to inspire others, I need to step out of that comfort zone more often. 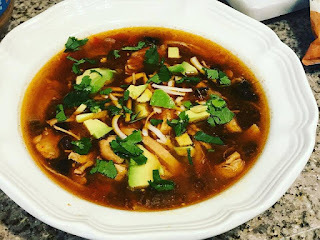 Along with stepping out of this comfort zone aka SAFE zone as I like to call it, I also have been trying some amazing new recipes and creating some amazing yumminess that the entire family has been enjoying. This is one of our amazing recipes we tried this week for the 30 days to Healthy Living and it made plenty for the whole week. I made the recipe without brown rice, but Jack's servings, I put rice in his cause he needs a little more carbs than me. Place a large sauce 6-8 quart pot over medium heat. Add the oil, chopped bell peppers, onions, and garlic. Saute for 3-5 minutes to soften. Add whole chicken breasts, black beans, diced tomatoes, chicken broth, chili powder, cumin, oregano, lime juice and salt and pepper to taste. If adding rice, stir it in with an additional 2 cups of water. Bring the soup to a boil. Lower the heat, and simmer for 20 minutes. Use tongs to remove the cooked chicken breasts. Allow the soup to continue simmering to fully cook the rice, another 10-15 minutes. Allow the chicken to cool for a few minutes, then shred with two forks. Once the rice is tender, add the shredded chicken back to the soup. Taste, and salt and pepper as needed.